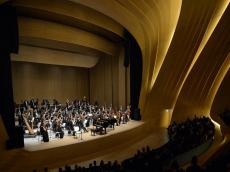 Today.Az - Philharmonic orchestra Tekfen performed in Baku with concert program "100 years"
Philharmonic orchestra Tekfen performed in Baku with concert program "100 years"
On June 5, the concert of the Philharmonic Orchestra Tekfen took place in the Heydar Aliyev Center. Trend reports that well-known figures of science, culture and art, representatives of the government, as well as the diplomatic corps took part in the concert dedicated to the 100th anniversary of the Azerbaijan Democratic Republic. At the concert, organized by the Heydar Aliyev Center and the construction company "Tekfen", the orchestra led world known conductor Aziz Shokhakimov performed brilliant musical numbers of classical music. At the music evening, the works of such outstanding composers as Gara Garayev, Haji Khanmamedov, as well as Ulvi Jemal Erkin (Turkey) and Charles Gounod (France) were performed. Performances at the concert as solo performers of the world-famous pianist Hussein Sermet and the performer of kyamancha Mehri Arifkizi made the evening even more colorful. The famous conductor Aziz Shokhakimov said in his interview to journalists that he likes Azerbaijan and he always wants to come to this country. He expressed satisfaction with his performance in Baku. He expressed admiration for Azerbaijani music, and the conductor stressed that he began to teach Azerbaijani dance. The performer of kyamancha Mehri Arifizi expressed her gratitude that she was honored to perform at the concert dedicated to the 100th anniversary of the Azerbaijan Democratic Republic together with the Philharmonic Orchestra Tekfen. It should be noted that the Tekfen Philharmonic Orchestra was founded in 1992. He gathered musicians from the Black Sea, Caspian and Eastern Mediterranean regions, which is why this orchestra is also known as the “Voice of Three Seas”.